Preferential rates will be valid until the end of 2018. The Verkhovna Rada on 30 May adopted the bill setting a sharp decline in excise taxes (2 to 28 times depending on the engine capacity) for used cars. The bill, supported by 237 deputies, temporary reduced the tax rates on passenger cars, produced after 1 January, 2010 for a period ending on 31 December, 2018 . 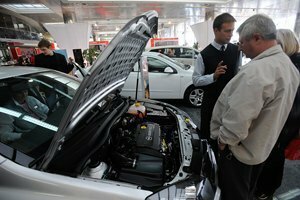 The preferential rate will not be applied to cars manufactured in Russia. The explanatory note to the bill, sponsored by about a hundred deputies, reads that against the background of the devaluation of the national currency and the fall of the purchasing power of the population, the sales of vehicles declined dramatically, resulting in job cuts at manufacturers, dwindling sales, and reduction in revenue. The law comes into force on the first day of the month following the month of publication, i.e. from 1 July, 2016. In 2015 14,2 thousand used car were registered in Ukraine, which is four times more than in 2014.